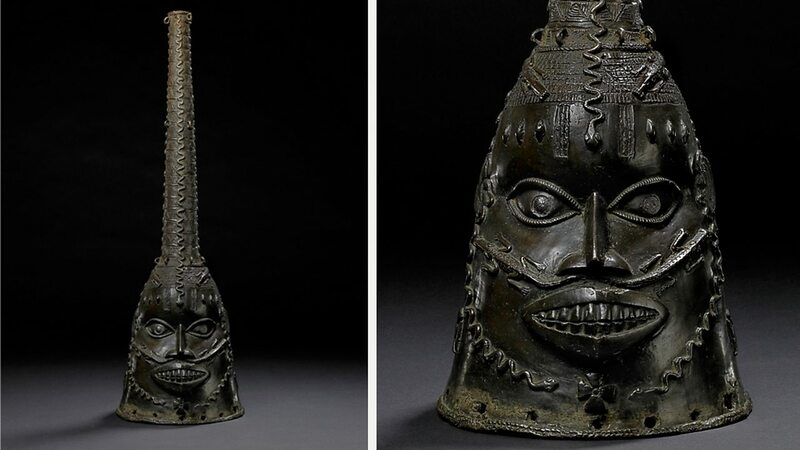 What can we learn from the art of Benin? The people of Benin made many different kinds of art. Village craft workers made simple pots, weapons and tools. They carved masks for ceremonies and they moulded sculptures of gods out of mud. 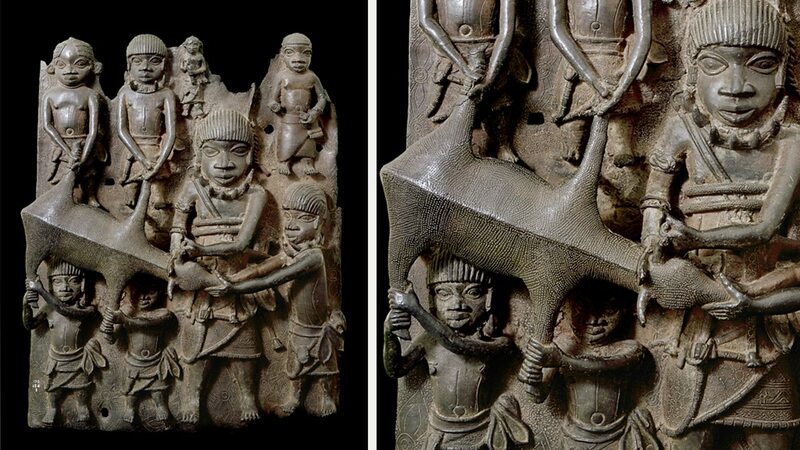 In Benin City, craft workers were organised into groups known as guilds. There were guilds for wood carvers, ivory carvers, leather workers, blacksmiths and weavers. Most important of all was the brass casters’ guild. They were only allowed to work for the Oba (king). 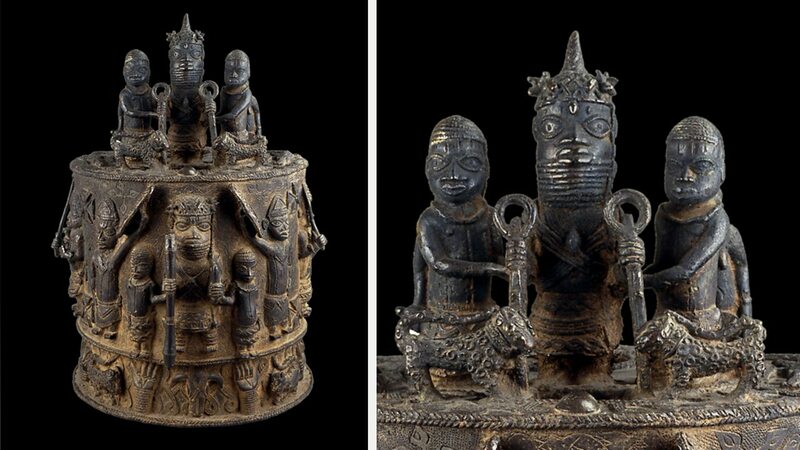 The art of Benin features people, animals and gods. It provides a fascinating guide to what life and religion were like in the kingdom of Benin. 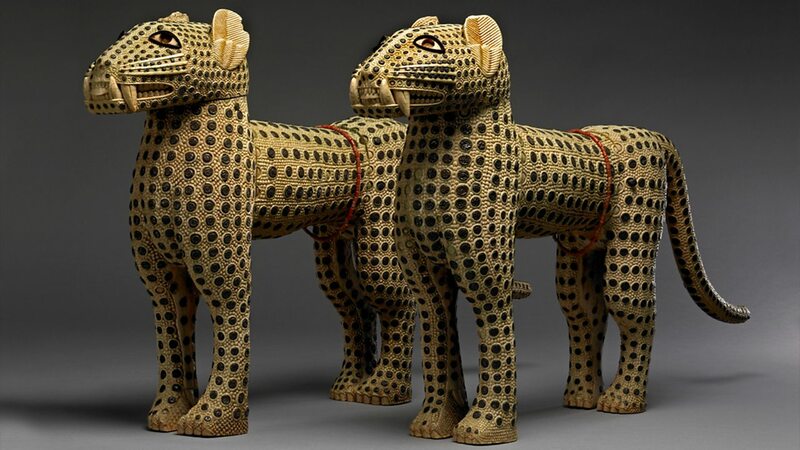 Some animals, such as crocodiles and leopards, appear many times in the art of Benin. They are used as symbols to demonstrate the power of their king, the Oba. Click on these animals to find out more. What materials did craft workers use? Craft workers in Benin used lots of different materials. People worked with clay, wood and leather. Weavers used fibres from plants to make colourful cloth. The most precious materials were brass, coral and ivory. People believed that brass had the power to drive away evil. It was so special that it could only be used in the royal court. The palace walls were covered with plaques made from brass and it was used to make figures and heads for the royal altars. Coral was also thought to have magical powers. It was seen as a gift from Olokun, god of the sea. Chiefs were allowed to wear coral necklaces, bracelets and anklets, but only the Oba could dress completely in coral. His people believed that when he wore his coral suit all his curses would come true! Ivory was seen as a symbol of purity and strength. Carved ivory tusks stood by the Oba’s throne and ivory bracelets and pendants were worn by the Oba and important chiefs. Metal workers in Benin made beautiful plaques, masks and statues for the Oba. 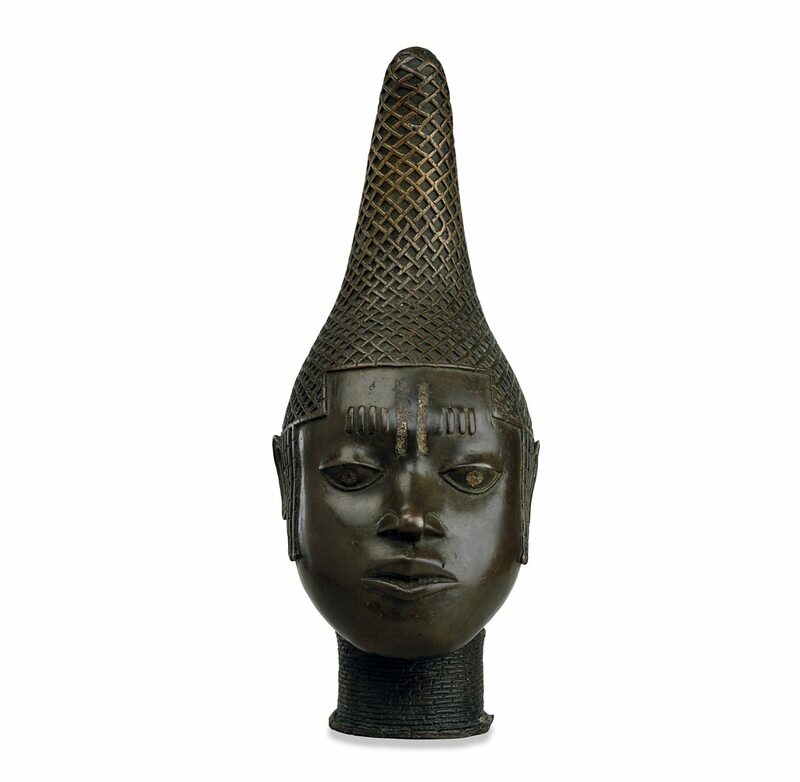 These are often called 'Benin Bronzes', however most are actually made of brass rather than bronze. Artwork from Benin reveals a lot about the kingdom’s people and their beliefs. What does art show us about life in Benin? These leopards were made in the 1800s. They are probably copies of an earlier pair that stood either side of the Oba's throne. Each one is made from five separate elephant’s tusks. The spots are copper discs and the eyes are made from mirrors. This brass mask represents Ora. He was a god who travelled with Prince Oranmiyan when he arrived to found the kingdom of Benin. The mask was worn by a dancer in the Ododua ceremony to celebrate the founding of Benin. 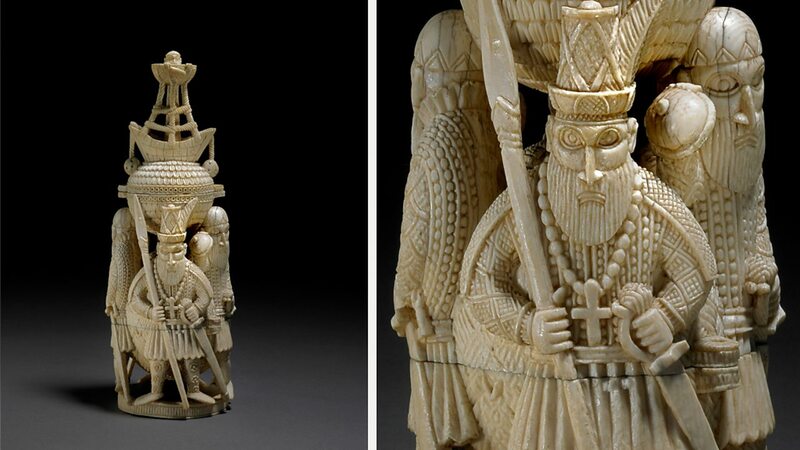 Ivory carvers usually worked for the Oba, but they made some items for Europeans as well. This container for holding salt was made in the 1500s. Four Portuguese merchants support the salt bowl, and there is a sailing ship on its lid. This brass plaque shows the Oba’s butchers carrying a cow to be sacrificed to the gods. The Oba sacrificed huge numbers of cattle to the gods. When he thought the gods were really angry he made human sacrifices too. Important chiefs and warriors had their own 'altars of the hand'. These miniature altars were often carved from wood, but the Oba's altars were made from brass. On top of this one is a figure of the Oba with his attendants. How were Europeans shown in art? The craft workers of Benin often showed Europeans in their art. Most of these foreign figures have long, narrow faces and straight, shoulder-length hair. Sometimes they have a beard and sometimes they wear armour and hold a gun. Can you imagine how different they must have looked to the African people? Even though the Europeans must have seemed very strange, they were welcomed by the people of Benin. The Obas had a good relationship with merchants from Europe until the 1800s, but then the Europeans changed their attitude. Instead of simply trading with African kingdoms, they wanted to take their land. In the late 1800s, European countries competed with each other for African land. They seized control of the African kingdoms and built their own empires. This brass statue shows a soldier. 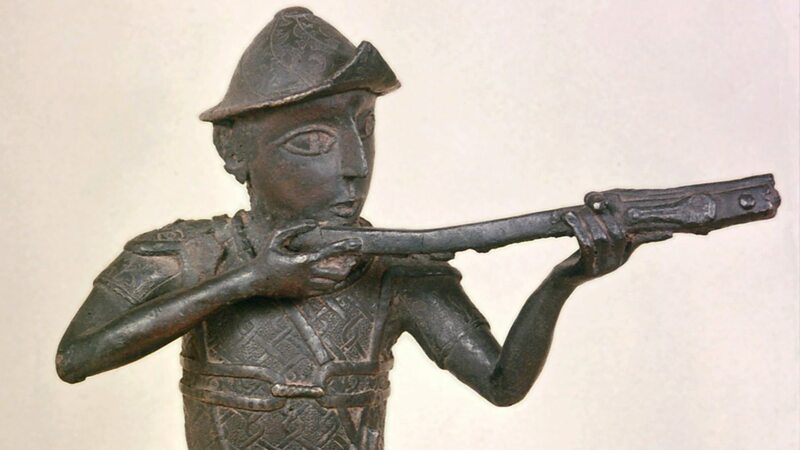 Europeans in Benin art were often shown holding a gun. Looking for the old Primary History website. Find it here.